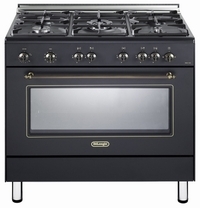 Overview of the major manufacturers of electric and gas stoves. How to choose an electric or gas stove? When are we going to move into a new house, the first question, which is becoming the most urgent - where and how to prepare food. We have some time can live without beds, cabinets, tables, and even without a refrigerator, but do not plate difficult. And even when our home for a long time is not new, the replacement of the failed boards - a top priority. But what to prefer - cooking on an open fire and buying a gas cooker or electrical stove modern comfort? This was announced today reflect many housewives. By what principle this is to choose the most necessary for us kitchen assistant? Let's try to sort out this issue together. So, what is wiser to choose? After all, gas and electric stove in the last few decades have become more functional, have undergone many changes in the operating principles and design, are much easier to use. Increased significantly, and their service life. We propose to consider a few aspects that guided the choice of the plate, you will most likely be able to make a successful purchase. Unfortunately, before some customers do not face a dilemma what to choose stove - gas or electric - for the simple reason that this issue has long been decided for them. It's simple. If your home was not originally supplied with gas, then a gas stove, of course, you have to forget. If you are in the presence of the gas pipe decided to use an electric stove, it is, in principle, is a task that is easier to solve. However, here too, there are nuances - in the house shall be a special separate power wiring for connecting a plate. It is not necessary only in one case - if you purchase a combined model with a gas hob and electric oven. For example, Indesit KN 3N11 S ​​(W). If you are engaged in the construction of the houses themselves, on an individual project, and a question which you will have to stand stove - gas or electric - you too can solve on their own. Here you and our useful advice. Electric stove: the pros and cons. Just say that the times when the electric stove is much inferior to the gas heating time but other characteristics, are long gone into oblivion. If previously you had to wait until half an hour until burner will heat to a boil even a simple kettle with water, now it all happens in a matter of minutes. After all, the same glass and heats and cools almost instantly. 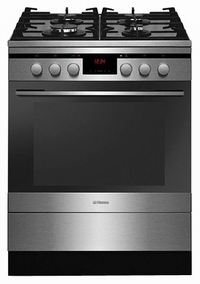 Modern electric stoves not only completely changed their design, but also have become much more agile and functional. Meals can be prepared in a much faster and better. The greatest advantage of electric plates before the gas is heated in that it is carried out more uniformly. 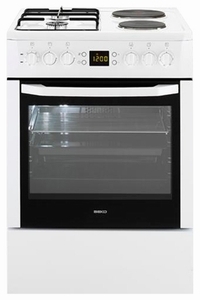 And electric oven allows you to maintain the desired temperature with an accuracy of one degree. What is also very important. And, of course, for such a stove is much easier to care for. Popular models - Gefest 2140, Beko CS 47100. The main disadvantage of operating electric stoves - their total dependence on the power supply. Electricity is more expensive than gas - this is the first. And the second - in the case of his absence, you will not be able to use the stove. Gas stove: advantages and disadvantages. And although the electric stove is more functional and reliable, a distinct advantage in many aspects still remains in the gas. Moreover, as we have said, today stove also undergone a lot of transformations. For example, a little above, we mentioned the fact that an electric cooker more uniform heating. But even if you prefer cooking on gas, today this can be achieved quite successfully. Suffice it to turn its attention to models of gas stoves with multi-loop rings, having two or more circuit flame. Another plus gas stove - fast temperature control burners by reducing and increasing the intensity of the fire. In addition, it is less demanding on the container. If you purchase a gas stove, you, unlike the hosts with a perfect electric ceramic hob, will not have to completely change the old pans with new ones. Even in a pot with an uneven bottom food will be cooked perfectly. 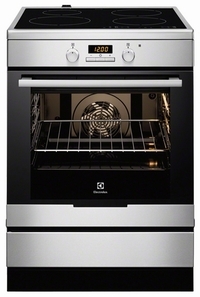 The most popular models of gas stoves produce firm Gefest, Gorenje, Hansa. For the benefit of a gas cooker is the fact that professional chefs prefer to cook it over an open fire. It is believed that the gaseous products of the plate heat more evenly and hence less lose their nutrients. Of the disadvantages of a gas stove in the first, and foremost, it is worth mentioning the harm from loss of combustion products, which can, however, minimize the installation of high quality drawing. And, of course, gas stove is more dangerous than electric. Even a small gas leak can lead to tragedy. Therefore, if you still prefer cooking over an open fire, our advice - be sure to select the plate with gas-control system. If the flame goes out, it will block the flow of gas to the burner. And a few more tips. Want to give you a couple of recommendations that will be useful both for purchase of gas and electric cookers. Be sure to make measurements at the point where it will be stove. And only on the basis of this, buy a new queen of kitchen - it should perfectly fit into the interior. Immediately identify with the material surface of the plate and the type of burners (we have already mentioned the multi-loop). Choosing the type of electric ovens, keep in mind that many of them there are several modes of heating and cooking programs. Decide what you need and what is not, not to overpay for those that you do not intend to use. At the same gas cookers important functions can be electric ignition system - you will not need to use matches. And the most important advice - remember that the dish can get incredibly delicious, even on a simple plate, and a failure on the ultra-modern multi-functional, if cooking does not have invested in a good mood, the soul and the ability to surprise, which I think is not to take every hostess.